For these first results, 1,042 migrants and refugees were interviewed from 07 December 2015 to 22 February 2016. 10% of respondents answered ‘yes’ to one of the trafficking and exploitation indicators, based on their own direct experience. An additional 1.2% of respondents had said that while they had not directly experienced situations captured by one of the trafficking and exploitation indicators, a member of their family travelling with them had. 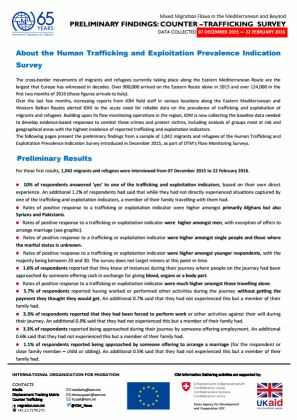 Rates of positive response to a trafficking or exploitation indicator were higher amongst primarily Afghans but also Syrians and Pakistanis. Further, rates of positive response to a trafficking or exploitation indicator were higher amongst men, with exception of offers to arrange marriage (see graphic).